The Mafia is not an actual organization. It has no individual head. Instead, the term "Mafia" refers to the various Families or groups of gangsters involved in organized crime. Most of these Mafia Families can trace their heritage back to Italy, predominantly Sicily. 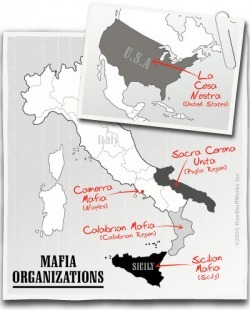 The Mafia is broadly divided into 5 groups based on the region where they operate or where they originated from. All the major Mafia gangs are involved in criminal enterprises all over the world and have bases in many nations. 1. The Sicilian Mafia - Originated from Sicily. 2. The Cammora Mafia - Originated from Naples. 3. The Calabrian Mafia - Originated from Italy's Calabrian province. 4. Sacra Corona Unita Mafia - Relatively recent group operating in the Puglia region of Italy. 5. La Cosa Nostra - The American Mafia. 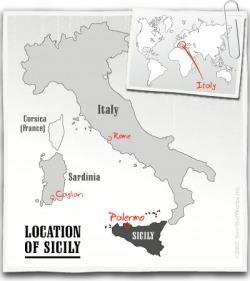 They have their roots in Sicily and Italy. There isn't a clear naming conception when it comes to naming Mafia Families. Families were generally names after the town or province from where they arrived. However, the name sometimes changed to the name of their Don, specially if he was there since a long time and had tremendous power and influence. Some Families were even named for the city in which they operated. Sicily had nearly 200 Mafia Families. Some of the most prominent are :- Greco Mafia family, Motisi Mafia family and Corleonesi Many emigrated to other regions, specially to the United States. The United States have many families too. Some of the most prominent are ;-Bonanno, Colombo, Gambino, Genovese, Lucchese, Buffalo crime family, Scarfo crime family, Los Angeles crime family ,etc.